Anti-Clockwise frae tap: Panorama view frae Cathedral Bell Touer, Kirk o St. Donatus an Bishops' palace on the Auncient Roman Forum, Varsity o Zadar, St Dominic's Kirk, Monument tae the Sun, Fowk's Squerr. 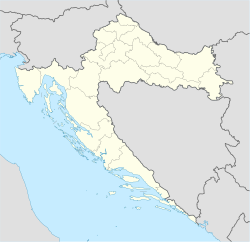 Zadar (pronounced [zâdar]; see ither names) is the auldest continuously inhabitit ceety in Croatie, situatit on the Adriatic Sea. ↑ "Banská Bystrica Sister Cities". © 2001-2008. Retrieved 2008-12-14.